Welcome to Shades of Blue Farms! We are a small ranch in west Pasco County Florida. 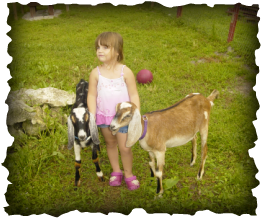 We strive to breed and maintain quality dairy goats for dairy and show and as pets. We are members with the AGS & the ADGA. All our goats are ADGA and AGS and some are also NDGA registered Nigerian Dwarfs. Our registered does are priced at $200 and up, registered bucks $150 and up and wethers are $75. Visit our Sale page to see what we currently have, or go to the Kidding Schedule to see what is on the way.